Objectives: Allogeneic hematopoietic stem cell trans­plantation has been used for several decades to treat patients with acute lymphoblastic leukemia. Total body irradiation has been promoted as an important component of conditioning regimens for this process; however, recent reports of chemotherapy-based conditioning regimens have shown comparable outcomes. Materials and Methods: We report our experience with radiation-free conditioning using busulfan and cyclophosphamide in 127 pediatric patients with acute lymphoblastic leukemia who were treated between 1997 and 2014. 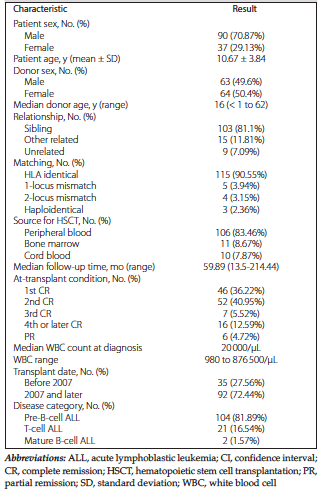 The median age was 11 years (range, < 1 to 15 y), 70% of patients were male, 81.1% received transplants from HLA-matched siblings, 83% received peripheral blood stem cells, 41% were in second complete remission at the time of transplant, and 83% had B-lineage immunophenotype. Results: In patients who were in complete remission at the time of transplant, 5-year overall survival, leukemia-free survival, and relapse rates were 62.48% (95% confidence interval, 52.29-71.09%), 49.43% (95% confidence interval, 39.57-58.53%), and 45.64% (95% confidence interval, 35.85-54.88%), respectively. We observed significant differences between outcomes in patients by time of transplant, presence of chronic graft-versus-host disease, and remission status. Conclusions: Our relapse rates were comparable to those shown in recent studies, although the transplant-related mortality rate was lower. The results of our study showed that a busulfan/cyclophosphamide condi­tioning regimen has acceptable outcomes without the undesirable adverse effects of total body irradiation, particularly in pediatric patients. Large multicenter studies are needed to assess less toxic conditioning regimens with fewer adverse effects in these patients. There have been contradicting results for and against TBI-free conditioning regimens in pediatric patients with ALL.16,28,29 Due to the lack of necessary equipment for TBI, our center has been exclusively performing HSCT using TBI-free conditioning regimens since the beginning of its activity.30 Although this fact was initially recognized as a shortcoming of HSCT for our patients, today, we can present it as an opportunity. Our results could be included in the ongoing debate on the desirability of TBI-free conditioning regimens for HSCT in pediatric ALL. All patients who had undergone HSCT from May 1997 until February 2014 and were 15 years old or younger were included in this study. To determine the availability of a human leukocyte antigen (HLA)-identical related donor before the scheduled HSCT, histocompatibility typing procedures of patients and donors were done by low-resolution molecular typing for HLA-A and HLA-B antigens and allelic typing for DRB1 (for patients receiving HSCT from siblings). High-resolution HLA typing was applied when other related donors or unrelated donors were considered, which included HLA-DR and HLA-C. The institutional review board and the ethics committee of the Hematology-Oncology and Stem Cell Transplantation Research Center (Tehran, Iran) reviewed and approved the study design. Written informed consent was obtained before HSCT from legal guardians of the patients. The day of HSCT was used as a reference point (day 0). The conditioning regimen consisted of oral busulfan at 4 mg/kg/day (4 times per day) from day -7 for 4 consecutive days or intravenous busulfan (doses of 1 mg/kg for patients weighing 9 kg and less, 1.2 mg/kg for those weighing 9-16 kg, 1.1 mg/kg for those weighing 16-23 kg, 0.95 mg/kg for those weighing 23-34 kg, and 0.8 mg/kg for those weighing more than 34 kg) at 4 times per day from day -7 for 4 consecutive days. This was followed by once daily intravenous cyclophosphamide (60 mg/kg/day) on days -3 and -2. Up to 2010, patients received only oral busulfan; recently, we have been able to administer intravenous busulfan (Busilvex; Pierre Fabre Medicament, Boulogne, France) to our patients. All patients had received an identical regimen during the course of the study. Recipients of HSCT from other related, unrelated, or HLA-mismatched donors were additionally treated with 2.5 mg/kg/day of rabbit antithymocyte globulin (Thymoglobulin, Sanofi-Aventis, Bridgewater, NJ, USA) for 2 days (for HSCT from matched other related or unrelated donors) or 3 days (for HSCT from HLA-mismatched donors) starting on day -3. Marrow harvests were obtained from iliac crests of donors under general anesthesia. Peripheral blood stem cells were mobilized from donors with granulocyte colony-stimulating factor. For graft-versus-host disease (GVHD) prophylaxis, patients received daily intravenous cyclosporine (initiated at 1.5 mg/kg from day -2), which was then increased to 3 mg/kg/day starting on day +7 in peripheral blood stem cells or on day +11 in bone marrow or cord blood stem cell transplant. A short course of methotrexate (10 mg/m2 on day +1 and 6 mg/m2 on days +3, +6, and +11) was also administered, except for patients who received HSCT from cord blood. All patients were hospitalized under strict isolation in rooms with high-efficiency particulate arresting filters. The same supportive care was provided for all patients, and nutritional supplementation was introduced by hyperalimentation. Prophylaxis for busulfan-mediated seizures was provided in the form of phenytoin. Monitoring for cytomegalovirus infection was performed by screening for cytomegalovirus DNA polymerase chain reaction or cytomegalovirus PP65 antigen twice per week. Screening for fungal infections was performed once per week by checking for galactomannan antigen. Antimicrobial prophylaxis with acyclovir, fluconazole, and sulfamethoxazole/trimethoprim was provided against viral, fungal, and Pneumocystis jiroveci infections. In the event that a blood product transfusion was needed, irradiated products were used. The level of cyclosporine was measured twice per week. Levels between 100 and 250 ng/dL were in the therapeutic range. The short tandem repeat method or fluorescence in situ hybridization was conducted on days 15 and 30 post-HSCT on bone marrow and on days 60, 90, and 180 post-HSCT on peripheral blood samples. These tests were done to monitor hematopoietic chimerism. Thereafter, patients were evaluated at months 12, 18, and 24 after HSCT and eventually every year. After discharge, patients were followed up in our post-HSCT clinic at weekly intervals during the first 60 days, which was reduced to every 2 weeks by day 100 after transplant. Eventually, follow-up would be conducted per the needs of each patient. Overall survival (OS) was measured from the time of HSCT to time of death or to last contact in surviving patients. Leukemia-free survival was defined as the time between HSCT and relapse, death, or last contact in patients without relapse or death event. Relapse rate was defined as the probability of having a relapse at a given time; death without a relapse was considered a competing event. Acute and chronic GVHD were defined according to consensus criteria.32,33 Transplant-related mortality (TRM) was defined as death from causes other than relapse or progression of the underlying medical condition. Continuous variables are presented as mean values and standard deviations, and categorical variables are shown as frequencies and percentages. Overall survival and LFS were calculated using the Kaplan-Meier method and were compared between the levels of categorical variables using log-rank test and accompanied by relevant 95% confidence intervals. Univariate and multivariate Cox proportional hazards models (with stepwise exclusion and inclusion of factors, using a criteria of P < .05 for retention and P > .1 for deletion of factors in the model) were used to identify factors that were independently associated with OS and LFS. We applied a stepwise selection method due to our small sample size. The effects of predictors on OS and LFS were described as hazard ratios (HR) with 95% confidence intervals. All analyses were done using STATA version 11.2 (StataCorp, College Station, TX, USA) and R language and environment software (R package “cmprsk”).36,37 P < .05 was considered as significant in all statistical analyses. This was a retrospective study of 127 pediatric ALL patients (90 boys and 37 girls) who received HSCT; the median age was 11 years (range, < 1 to 15 y). Patients received treatment at our center between 1997 and 2014, with most receiving transplants from HLA-matched siblings. At diagnosis, all eligible patients were treated with a chemotherapy regimen adapted from the ALL IC-Berlin-Frankfurt-Munster trial protocol. Except for 6 patients, all other patients showed morphologic CR (< 5% bone marrow blast) at the time of HSCT. These 6 patients were not excluded from the analysis. The characteristics of patients and donors are provided in Table 1. The median follow-up time was 59.89 months (range, 13.5-214.4 mo). Although both 5-year LFS and OS were significantly different among patients transplanted at first, second, or more advanced CR (P < .001), no patients who were transplanted at partial remission survived more than 7 months after HSCT (4 had relapse-related mortality and 2 had TRM). In patients who had CR at the time of transplant, 5-year OS and LFS rates were 62.48% and 49.43%, respectively. Five-year OS was significantly different between patients who had received HSCT before 2007 (45.71%) and those who underwent HSCT in 2007 or later (66.47%; P = .03). Most patients (83.46%) received hematopoietic stem cells from peripheral blood. Distribution of different hematopoietic stem cell sources among other subcategories was uneven. Furthermore, we were not able to calculate some variables in survival statistics for patients in the cord blood subgroup. A combination of the above hindered meaningful analysis of these results; however, we found that the source of hematopoietic stem cells did not influence overall outcomes. Of total patients, 86 (67.72%) developed acute GVHD, with 64 patients (74.4%) having grade I/II and 22 (25.6%) having grade III/IV acute GVHD. No significant differences in incidence or severity of acute GVHD were observed regarding the source of HSCT, relation to donor, and degree of HLA disparity. Chronic GVHD occurred in 49 patients (38.58%), with 37 patients (75.5%) developing limited and 12 patients (24.5%) developing extensive chronic GVHD. The cumulative incidence of chronic GVHD was significantly different among patients in various relation subgroups (P = .001). Patients who experienced chronic GVHD had a statistically higher 5-year OS rate (67.61%) than those without chronic GVHD (55.16%; P = .02) (Table 2). No differences in LFS or OS were identified between patients with and without high grades of both acute and chronic GVHD. We observed significant differences in TRM among patients transplanted at first, second, or more advanced CR (P < .001); the main cause of death was relapse (39 deaths, 83.0%). Due to skewness of the data, only patients who had received HSCTs from an HLA-matched related donor were included in the regression models. Based on our regression model, occurrence of chronic GVHD (HR = 0.44), being female (HR = 0.31), and being at second remission at the time of HSCT (HR = 0.47) predicted an increase in OS. With regard to LFS, chronic GVHD (HR = 0.36) and being female (HR = 0.39) predicted more favorable outcomes (Table 3 and Table 4). Although some previous studies have not found any differences in outcomes of HSCT among patients transplanted at first CR, second CR, or more advanced CR,40,41 other studies have demonstrated significant differences.42,43 In our study, we also found LFS, relapse rate, and TRM to be significantly different among patients transplanted at first, second, or more advanced CR. 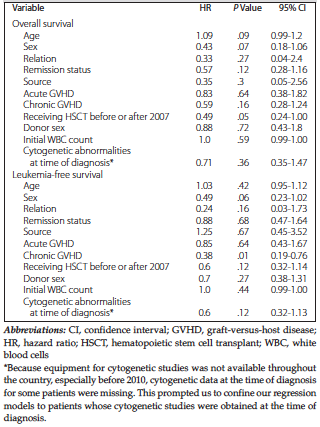 We also found that patients who were transplanted at partial remission did not benefit from HSCT, as none survived beyond the first year after HSCT. These findings should be weighed against another HSCT study on relapse or induction failure in patients with acute leukemia43 who received TBI and stem cells from unrelated donors. The 3-year OS for patients with ALL who had undergone HSCT and were not in CR was 16%. We found that patients who developed chronic GVHD had significantly better 5-year OS, LFS, and relapse rates. These patients also had lower TRM, although differences were not statistically significant. Our findings have been corroborated by publications by Zikos and associates43 and Thepot and associates.42 Our regression models verified that chronic GVHD is a predictor of higher OS and disease-free survival. However, we did not find any differences in outcomes by grade of acute GVHD, and no association was found between outcomes and stem cell source. In reports from MacMillan and associates44 and Garderet and associates,45 HSCT from peripheral blood samples was suggested to be not as effective as bone marrow. However, Madero and associates46 and Vicent and associates47 did not report such a difference between these 2 sources. Another study on HSCT from unrelated cord blood in pediatric ALL suggested that using TBI as a preparative regimen was associated with lower relapse rates; because most patients in our study received HSCT from HLA-matched peripheral blood sources, a comparison was not meaningful. Our analyses showed that 5-year OS and relapse rates were considerably superior in patients who had received HSCT more recently (between 2006 and 2014), since an independent pediatric ward was created in our center. As staff and group members gain more experience with pediatric HSCT, we expect even better outcomes over time. An additional factor may be improvements in supportive care and closer monitoring of patients. Overall, although the 5-year relapse rate in our patients was slightly more than some other studies,48,49 the 5-year LFS and TRM rates were comparable.50-55 Although differences between busulfan-cyclo­phosphamide and TBI-cyclophosphamide regimens are mainly the higher TRM with the former, various undesirable adverse effects of TBI in children may make the busulfan-cyclophosphamide regimen more desirable. Because our study showed higher relapse rates, we were not able to determine the significance of this difference without controlling for some confounders. A closer examination of all existing data in this field is required. Of note, on the basis of our unpublished findings, there were no significant differences in OS and LFS between oral and intravenous busulfan. We found that, although incidence of relapse rate was higher among our patients, OS and LFS were comparable with other studies. We suggest that further investigations on the short-term and long-term efficacy and toxicity of busulfan-cyclo­phosphamide conditioning regimens, without TBI, in pediatric ALL HSCT and 2-arm multicenter studies are warranted. 1. Peters C, Schrauder A, Schrappe M, et al. Allogeneic haematopoietic stem cell transplantation in children with acute lymphoblastic leukaemia: the BFM/IBFM/EBMT concepts. Bone Marrow Transplant. 2005;35 Suppl 1:S9-11. Mehta PA, Davies SM. Allogeneic transplantation for childhood ALL. Bone Marrow Transplant. 2008;41(2):133-139. Davies SM, Ramsay NK, Klein JP, et al. Comparison of preparative regimens in transplants for children with acute lymphoblastic leukemia. J Clin Oncol. 2000;18(2):340-347. Gupta V, Lazarus HM, Keating A. Myeloablative conditioning regimens for AML allografts: 30 years later. Bone Marrow Transplant. 2003;32(10):969-978. Tutschka PJ, Copelan EA, Klein JP. Bone marrow transplantation for leukemia following a new busulfan and cyclophosphamide regimen. Blood. 1987;70(5):1382-1388. Copelan EA, Hamilton BK, Avalos B, et al. Better leukemia-free and overall survival in AML in first remission following cyclophosphamide in combination with busulfan compared with TBI. Blood. 2013;122(24):3863-3870. Nagler A, Rocha V, Labopin M, et al. Allogeneic hematopoietic stem-cell transplantation for acute myeloid leukemia in remission: comparison of intravenous busulfan plus cyclophosphamide (Cy) versus total-body irradiation plus Cy as conditioning regimen--a report from the acute leukemia working party of the European group for blood and marrow transplantation. J Clin Oncol. 2013;31(28):3549-3556. Champlin RE. Busulfan or TBI: answer to an age-old question. Blood. 2013;122(24):3856-3857. Uberti JP, Agovi MA, Tarima S, et al. Comparative analysis of BU and CY versus CY and TBI in full intensity unrelated marrow donor transplantation for AML, CML and myelodysplasia. Bone Marrow Transplant. 2011;46(1):34-43. Kroger N, Zabelina T, Kruger W, et al. Comparison of total body irradiation vs busulfan in combination with cyclophosphamide as conditioning for unrelated stem cell transplantation in CML patients. Bone Marrow Transplant. 2001;27(4):349-354. Shi-Xia X, Xian-Hua T, Hai-Qin X, Bo F, Xiang-Feng T. Total body irradiation plus cyclophosphamide versus busulphan with cyclophosphamide as conditioning regimen for patients with leukemia undergoing allogeneic stem cell transplantation: a meta-analysis. Leuk Lymphoma. 2010;51(1):50-60. Santos GW. Busulfan and cyclophosphamide versus cyclophosphamide and total body irradiation for marrow transplantation in chronic myelogenous leukemia--a review. Leuk Lymphoma. 1993;11 Suppl 1:201-204. Carpenter PA, Marshall GM, Giri N, Vowels MR, Russell SJ. Allogeneic bone marrow transplantation for children with acute lymphoblastic leukemia conditioned with busulfan, cyclophosphamide and melphalan. Bone Marrow Transplant. 1996;18(3):489-494. Ringden O, Labopin M, Tura S, et al. A comparison of busulphan versus total body irradiation combined with cyclophosphamide as conditioning for autograft or allograft bone marrow transplantation in patients with acute leukaemia. Acute Leukaemia Working Party of the European Group for Blood and Marrow Transplantation (EBMT). Br J Haematol. 1996;93(3):637-645. Bunin N, Aplenc R, Kamani N, Shaw K, Cnaan A, Simms S. Randomized trial of busulfan vs total body irradiation containing conditioning regimens for children with acute lymphoblastic leukemia: a Pediatric Blood and Marrow Transplant Consortium study. Bone Marrow Transplant. 2003;32(6):543-548. Eroglu C, Pala C, Kaynar L, et al. Comparison of total body irradiation plus cyclophosphamide with busulfan plus cyclophosphamide as conditioning regimens in patients with acute lymphoblastic leukemia undergoing allogeneic hematopoietic stem cell transplant. Leuk Lymphoma. 2013;54(11):2474-2479. Kato K, Yoshida N, Matsumoto K, Matsuyama T. Fludarabine, cytarabine, granulocyte colony-stimulating factor and melphalan (FALG with L-PAM) as a reduced toxicity conditioning regimen in children with acute leukemia. Pediatr Blood Cancer. 2014;61(4):712-716. Hamidieh A, Kargar M, Jahani M, et al. The outcome of allogeneic hematopoietic stem cell transplants without total body irradiation in pediatric patients with acute lymphoblastic leukemia: single centre experience. J Pediatr Hematol Oncol. 2012;34(2):101-107. Christopoulos P, Bertz H, Ihorst G, Marks R, Wasch R, Finke J. Radiation-free allogeneic conditioning with fludarabine, carmustine, and thiotepa for acute lymphoblastic leukemia and other hematologic malignancies necessitating enhanced central nervous system activity. Biol Blood Marrow Transplant. 2012;18(9):1430-1437. Chemaitilly W, Boulad F, Oeffinger KC, Sklar CA. Disorders of glucose homeostasis in young adults treated with total body irradiation during childhood: a pilot study. Bone Marrow Transplant. 2009;44(6):339-343. Majhail NS, Rizzo JD, Lee SJ, et al. Recommended screening and preventive practices for long-term survivors after hematopoietic cell transplantation. Rev Bras Hematol Hemoter. 2012;34(2):109-133. Afessa B, Litzow MR, Tefferi A. Bronchiolitis obliterans and other late onset non-infectious pulmonary complications in hematopoietic stem cell transplantation. Bone Marrow Transplant. 2001;28(5):425-434. Uderzo C, Pillon M, Corti P, et al. Impact of cumulative anthracycline dose, preparative regimen and chronic graft-versus-host disease on pulmonary and cardiac function in children 5 years after allogeneic hematopoietic stem cell transplantation: a prospective evaluation on behalf of the EBMT Pediatric Diseases and Late Effects Working Parties. Bone Marrow Transplant. 2007;39(11):667-675. Miralbell R, Bieri S, Mermillod B, et al. Renal toxicity after allogeneic bone marrow transplantation: the combined effects of total-body irradiation and graft-versus-host disease. J Clin Oncol. 1996;14(2):579-585. Socie G, Curtis RE, Deeg HJ, et al. New malignant diseases after allogeneic marrow transplantation for childhood acute leukemia. J Clin Oncol. 2000;18(2):348-357. Faraci M, Lanino E, Dini G, et al. Severe neurologic complications after hematopoietic stem cell transplantation in children. Neurology. 2002;59(12):1895-1904. Kunkele A, Engelhard M, Hauffa BP, et al. Long-term follow-up of pediatric patients receiving total body irradiation before hematopoietic stem cell transplantation and post-transplant survival of >2 years. Pediatr Blood Cancer. 2013;60(11):1792-1797. Aristei C, Santucci A, Corvo R, et al. In haematopoietic SCT for acute leukemia TBI impacts on relapse but not survival: results of a multicentre observational study. Bone Marrow Transplant. 2013;48(7):908-914. Hunger SP, Loh KM, Baker KS, Schultz KR. Controversies of and unique issues in hematopoietic cell transplantation for infant leukemia. Biol Blood Marrow Transplant. 2009;15(1 Suppl):79-83. Hamidieh AA, Mozafari M, Noshad S, Alimoghaddam K, Behfar M, Ghavamzadeh A. Matched related donor hematopoietic stem cell transplantation results in a long-term follow-up of a pediatric acquired severe aplastic anemia subset: A stem cell source perspective. Pediatr Transplant. 2015;19(4):399-407. Rihn C, Cilley J, Naik P, Pedicano AV, Mehta J. Definition of myeloid engraftment after allogeneic hematopoietic stem cell transplantation. Haematologica. 2004;89(6):763-764. Atkinson K, Horowitz MM, Gale RP, Lee MB, Rimm AA, Bortin MM. Consensus among bone marrow transplanters for diagnosis, grading and treatment of chronic graft-versus-host disease. Committee of the International Bone Marrow Transplant Registry. Bone Marrow Transplant. 1989;4(3):247-254. Jacobsohn DA. Acute graft-versus-host disease in children. Bone Marrow Transplant. 2008;41(2):215-221. Jeha S, Gaynon PS, Razzouk BI, et al. Phase II study of clofarabine in pediatric patients with refractory or relapsed acute lymphoblastic leukemia. J Clin Oncol. 2006;24(12):1917-1923. Reiter A, Schrappe M, Ludwig WD, et al. Chemotherapy in 998 unselected childhood acute lymphoblastic leukemia patients. Results and conclusions of the multicenter trial ALL-BFM 86. Blood. 1994;84(9):3122-3133. R Core Team. R: A language and environment for statistical computing 2015; https://www.R-project.org/. Gray B. cmprsk: Subdistribution Analysis of Competing Risks. R package version 2.2-7. 2014; http://CRAN.R-project.org/package=cmprsk. Heinzelmann F, Ottinger H, Muller CH, et al. Total-body irradiation--role and indications: results from the German Registry for Stem Cell Transplantation (DRST). Strahlenther Onkol. 2006;182(4):222-230. Boztug H, Zecca M, Sykora KW, et al. Treosulfan-based conditioning regimens for allogeneic HSCT in children with acute lymphoblastic leukaemia. Ann Hematol. 2015;94(2):297-306. Jacobsohn DA, Hewlett B, Ranalli M, Seshadri R, Duerst R, Kletzel M. Outcomes of unrelated cord blood transplants and allogeneic-related hematopoietic stem cell transplants in children with high-risk acute lymphocytic leukemia. Bone Marrow Transplant. 2004;34(10):901-907. Jamieson CH, Amylon MD, Wong RM, Blume KG. Allogeneic hematopoietic cell transplantation for patients with high-risk acute lymphoblastic leukemia in first or second complete remission using fractionated total-body irradiation and high-dose etoposide: a 15-year experience. Exp Hematol. 2003;31(10):981-986. Thepot S, Zhou J, Perrot A, et al. The graft-versus-leukemia effect is mainly restricted to NIH-defined chronic graft-versus-host disease after reduced intensity conditioning before allogeneic stem cell transplantation. Leukemia. 2010;24(11):1852-1858. Zikos P, Van Lint MT, Lamparelli T, et al. Allogeneic hemopoietic stem cell transplantation for patients with high risk acute lymphoblastic leukemia: favorable impact of chronic graft-versus-host disease on survival and relapse. Haematologica. 1998;83(10):896-903. MacMillan ML, Davies SM, Nelson GO, et al. Twenty years of unrelated donor bone marrow transplantation for pediatric acute leukemia facilitated by the National Marrow Donor Program. Biol Blood Marrow Transplant. 2008;14(9 Suppl):16-22. Garderet L, Labopin M, Gorin NC, et al. Patients with acute lymphoblastic leukaemia allografted with a matched unrelated donor may have a lower survival with a peripheral blood stem cell graft compared to bone marrow. Bone Marrow Transplant. 2003;31(1):23-29. Madero L, Gonzalez Vincent M, Ramirez M, Quintero V, Benito A, Diaz MA. Clinical and economic comparison of allogeneic peripheral blood progenitor cell and bone marrow transplantation for acute lymphoblastic leukemia in children. Bone Marrow Transplant. 2000;26(3):269-273. Vicent MG, Madero L, Ortega JJ, et al. Matched-pair analysis comparing allogeneic PBPCT and BMT from HLA-identical relatives in childhood acute lymphoblastic leukemia. Bone Marrow Transplant. 2002;30(1):9-13. Doney K, Gooley TA, Deeg HJ, Flowers ME, Storb R, Appelbaum FR. Allogeneic hematopoietic cell transplantation with full-intensity conditioning for adult acute lymphoblastic leukemia: results from a single center, 1998-2006. Biol Blood Marrow Transplant. 2011;17(8):1187-1195. Fagioli F, Zecca M, Rognoni C, et al. Allogeneic hematopoietic stem cell transplantation for Philadelphia-positive acute lymphoblastic leukemia in children and adolescents: a retrospective multicenter study of the Italian Association of Pediatric Hematology and Oncology (AIEOP). Biol Blood Marrow Transplant. 2012;18(6):852-860. Burke MJ, Gossai N, Wagner JE, et al. Survival differences between adolescents/young adults and children with B precursor acute lymphoblastic leukemia after allogeneic hematopoietic cell transplantation. Biol Blood Marrow Transplant. 2013;19(1):138-142. Balduzzi A, De Lorenzo P, Schrauder A, et al. Eligibility for allogeneic transplantation in very high risk childhood acute lymphoblastic leukemia: the impact of the waiting time. Haematologica. 2008;93(6):925-929. Smith AR, Baker KS, Defor TE, Verneris MR, Wagner JE, Macmillan ML. 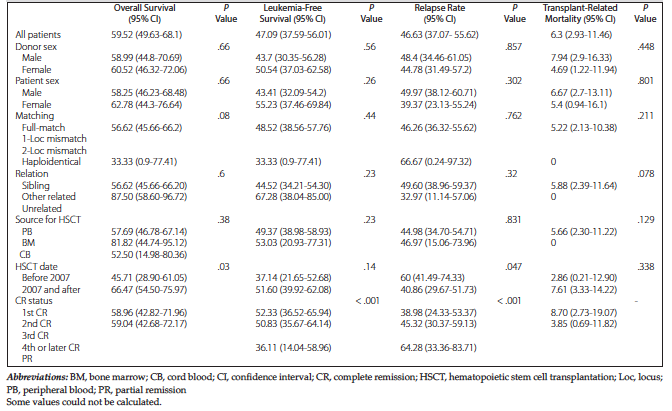 Hematopoietic cell transplantation for children with acute lymphoblastic leukemia in second complete remission: similar outcomes in recipients of unrelated marrow and umbilical cord blood versus marrow from HLA matched sibling donors. Biol Blood Marrow Transplant. 2009;15(9):1086-1093. Kennedy-Nasser AA, Bollard CM, Myers GD, et al. Comparable outcome of alternative donor and matched sibling donor hematopoietic stem cell transplant for children with acute lymphoblastic leukemia in first or second remission using alemtuzumab in a myeloablative conditioning regimen. Biol Blood Marrow Transplant. 2008;14(11):1245-1252. Wood WA, Lee SJ, Brazauskas R, et al. Survival improvements in adolescents and young adults after myeloablative allogeneic transplantation for acute lymphoblastic leukemia. Biol Blood Marrow Transplant. 2014;20(6):829-836. Kato M, Horikoshi Y, Okamoto Y, et al. Second allogeneic hematopoietic SCT for relapsed ALL in children. Bone Marrow Transplant. 2012;47(10):1307-1311. Thomas ED, Buckner CD, Banaji M, et al. One hundred patients with acute leukemia treated by chemotherapy, total body irradiation, and allogeneic marrow transplantation. Blood. 1977;49(4):511-533. Acknowledgements: We have no conflicts of interest to disclose. No honorarium, grants, or other forms of payment were given to anyone to produce the manuscript. We acknowledge the selfless contributions of the nursing staff in the pediatric wing of the Hematology-Oncology and Stem Cell Transplantation Research Center, Shariati Hospital, during the past 2 decades. We also express our sincere gratitude to our data center for making this study possible. Copyright © Baskent University 2019. Printed in Turkey. All Rights Reserved.